Close off an end or divide a White or Platinum Elfa Shelf Basket into sections with our exclusive Clear Elfa Shelf Basket Dividers - sold in a package of two. Clear Elfa Shelf Basket Dividers is rated 4.3 out of 5 by 6. Rated 4 out of 5 by CCDC from Great but wish it came in odd numbers When you get these, don't forget that you need them to enclose the shelf ends - they start open. So if you want to divide the shelf into two or more baskets, you'll need at least two sets of these. To that end, it would be nice if they came individually, so you could divide the shelf into even numbers of compartments without having left over dividers. Will this fit for 12&quot; elfa Shelf Basket? 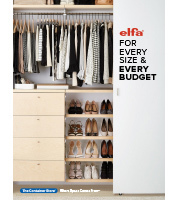 It doesn't look like there's one for 12&quot; elfa Shelf Basket on sale. This product only fits our elfa 16&quot; Ventilated Shelf Baskets. can I use the basket dividers in the elfa mesh drawers? These dividers will not work with the mesh drawers. could you use these with just shelves, without the basket part? I'm reusing old Elfa wire shelves in new closet. The shelves I have don't fit perfectly in my new closet, so there's a few inches on either side. Could I use the basket ends/dividers (without the basket part) to keep things from falling down the sides? Other than the slight unfinished edge on the front that I'd have, would my idea work? Thanks! The elfa Shelf Basket Dividers are specifically designed to fit elfa Shelf Baskets. To divide an elfa Ventilated Shelf, The Container Store offers Ventilated Shelf Dividers. Also, elfa Clip Bookends can be inserted directly into a Standard or Upright for additional support. Please see my product recommendations below.